It's easier than ever to save cash with Marquay holiday packages on Expedia. You'll have heaps more time to arrange your exciting experiences — and more spending money! Gain savings of up to 15%* when you book a package deal on Expedia. Our impressive database features more than 321,000 properties worldwide and 400 partner airlines. With such a great range of options, organising your dream holiday will be simple! Rest assured that you may cancel almost any hotel reservation and you won't have to pay a cancellation fee to us. Itinerary looking a little thin? Marquay holiday all arranged but no idea what to do when you arrive? Let us guide you. Let your inner adventurer run wild at Grotte des Combarelles. Just make sure you take a head torch! Adventurers are spoilt for choice in and around this destination. Explore the age-old walkways of Chateau de Commarque. This grand fortification provides an informative day trip for the entire family. Still have some time on your hands? Choose a comfortable vantage point and watch life go by at Place de la Liberte. If you're feeling talkative, this time-worn square is also an awesome spot to hang out with some locals. With 16 properties located close to the heart of the city, searching for a place to stay in Marquay will be a cinch. Book now through Expedia to get the hottest deals on luxury getaways and cheap holidays. Kick-start your quest for a dreamy Marquay base by looking into the latest offers at the Clos La Boetie (95/97, Avenue de Selves) and the Plaza Madeleine Hotel & Spa (1 Place De La Petite Rigaudie). 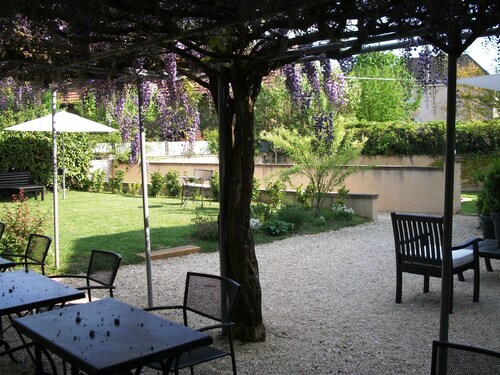 Alternatively, if you're travelling on a shoestring, the O Clair de Lune (29 rue du Breuil) or the Logis Hôtel Montaigne (2 Place Pasteur) may better suit your needs. If your planning on arriving by plane, you'll probably be landing at Brive - Vallee de la Dordogne Airport (BVE). Once you've retrieved your suitcases from baggage claim and headed out of the terminal, downtown Marquay will be 20 miles (32 km) away. 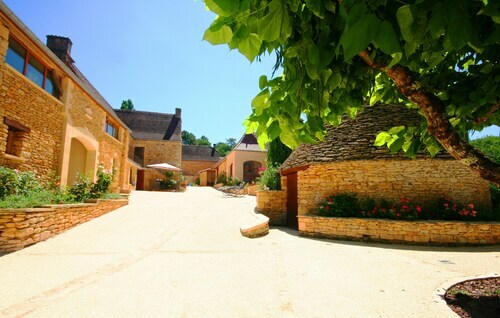 Situated in the historical district, this hotel is 2.6 mi (4.2 km) from Chateau de Commarque and 9.2 mi (14.9 km) from La Roque St-Christophe. Cave of Lascaux and Chateau de Marqueyssac are also within 16 mi (25 km). 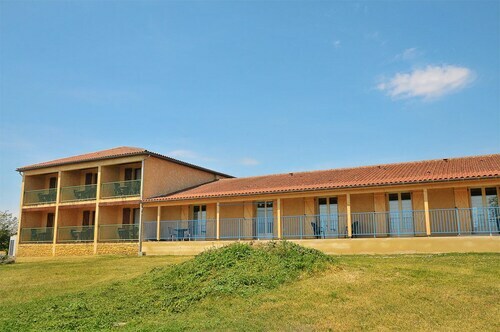 Situated in Marquay, this hotel is within 3 miles (5 km) of Chateau de Commarque, Chateau de Laussel and Etang de Tamnies. Abri du Cap Blanc and Grotte des Combarelles are also within 6 miles (10 km). This family-friendly Marquay holiday home is within 3 mi (5 km) of Chateau de Laussel and Abri du Cap Blanc. Etang de Tamnies and Vezere Valley are also within 6 miles (10 km). Situated in Marquay, this holiday home is 1.9 mi (3.1 km) from Chateau de Laussel and 2.3 mi (3.7 km) from Abri du Cap Blanc. Chateau de Commarque and Etang de Tamnies are also within 6 miles (10 km). 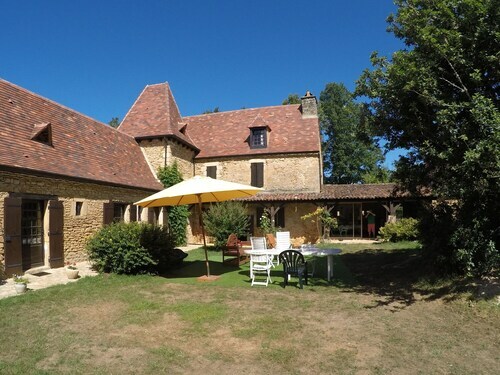 Situated in the historical district, this bed & breakfast is within 6 miles (10 km) of Chateau de Commarque, Etang de Tamnies and Manoir de Gisson. Chateau de Laussel and Place de la Liberte are also within 6 miles (10 km). Situated in a rural location, this holiday home is 2.9 mi (4.6 km) from Etang de Tamnies and 2.9 mi (4.7 km) from Chateau de Commarque. Chateau de Laussel and Abri du Cap Blanc are also within 6 miles (10 km). Situated in a rural location, this holiday home is within 3 miles (5 km) of Etang de Tamnies, Chateau de Commarque and Chateau de Laussel. Abri du Cap Blanc is 3.1 mi (5 km) away. Situated near the boardwalk, this bed & breakfast is within 3 miles (5 km) of Etang de Tamnies, Chateau de Commarque and Chateau de Laussel. Abri du Cap Blanc and Grotte des Combarelles are also within 9 miles (15 km).